Bioremediation means use of living organism to solve an environmental problem such as contaminated soil or groundwater. Some microorganisms that live in soil and groundwater naturally eat and degrade certain chemicals that are harmful to people and the environment. The microorganisms are able to change these chemicals into water and harmless compounds. This technology includes phytoremediation (plants) and rhizoremediation (plant and microbe interaction). Plants can also be used to clean up soil, water or air; this is called phytoremediation. Rhizoremediation, which is the most evolved process of bioremediation, involves the removal of specific contaminants by mutual interaction of plant roots and suitable microbial flora. 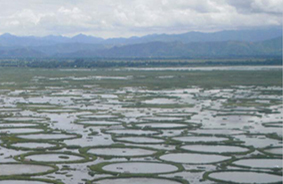 Photo to right: Loktak lake (Ramsar site) in Manipur showing characteristic Phumdis (floating islands). This water body is serving as a receptacle for sewage and agrochemicals. The various aquatic plants are playing a major role in phytosanitation and bioremediation.